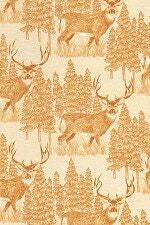 Wildlife and nature in a beautiful ecru/cream. 100% cotton quilting fabric for a special quilt or a home decoration projects. Every outdoor enthusiast deserves a gift made from this fabric or any of our outdoor nature fabric from The Quilted Nursery Fabric Store. All fabric from The Quilted Nursery is cut directly from the bolt and is available by the yard.